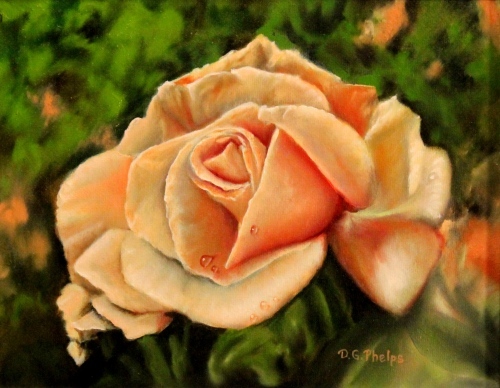 Peach Rose oil painting for sale. 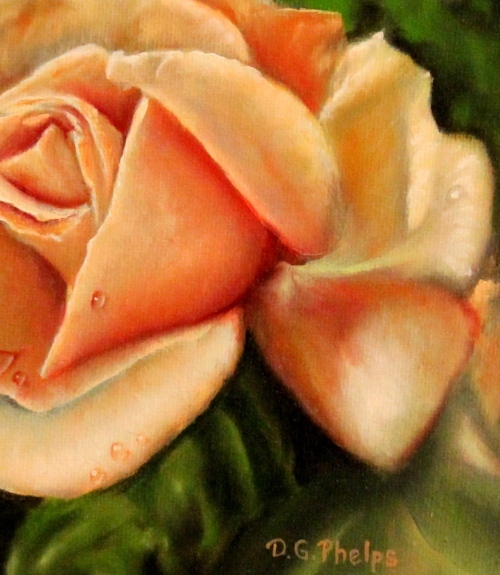 Peach Rose oil painting and why this makes a great gift. 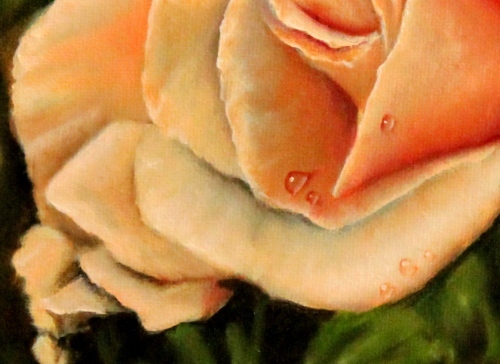 Home > Extreme Fine Art Gallery >Rose oil painting and meaning. This peach rose oil painting and what it stands for is explained below. Wanting to do a very delicate and small painting, this delicate single peach bloom fit the bill perfectly. 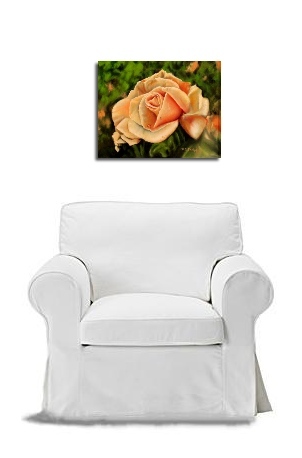 This rose is on an 8" x 10" gallery wrapped canvas. It doesn't need a frame, and is ready to hang. If you wish however to make a bigger impact, silver, gold or a black 3.5" wide frame really makes it pop. Because it's a standard sized canvas, this is easy to do. This is one of my more impressionistic style works. Even though I used the layered approach in its execution, I left many areas (the background mostly) fairly loose. You can see too in the close ups that much of the underlying gray layers are showing through to give this work a special look within the half shadows. Now about what the painting represents, so you understand if you purchase this little jewel as a gift, you will understand the meaning behind the color. Did you know the since Victorian times, giving certain meanings to different kinds and colors of flowers became THE tradition. And it's persisted to the present day. Now, what does this colored rose mean? It is a message of appreciation or thanks. So when you have that special someone in your life, the peach rose lets them know you're glad they are part of your life. 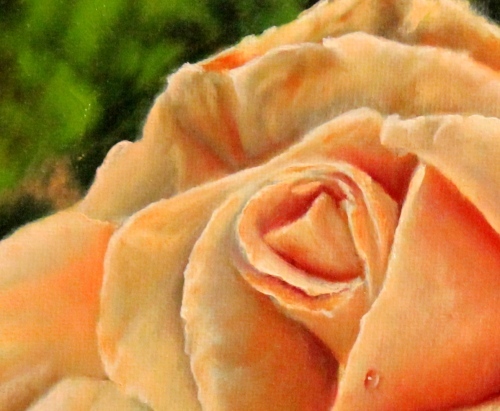 The color peach or pale peach in a rose which this is depicted in the oil painting, means modesty. It is representative of a virgins soft blush, her purity and innocence. Her feelings of reserved constraint and tender heart are part of this too. This particular color also represents the sincerity and genuineness of any relationship. So, when your relationship is genuine, and there is gratitude and thankfulness within your heart, make sure the peach colored rose is also a part of your gift giving. Because the rose expresses sincerity and admiration, it is very appropriate to give to a teacher or mentor that you admire. Do you need additional information on my painting method and guarantee when buying art online? Click the link, it opens in a new window for you. Head back to the top of this Peach Rose page. Need more information on the Meaning of Color in Roses? Click this link for an expanded article on the subject.